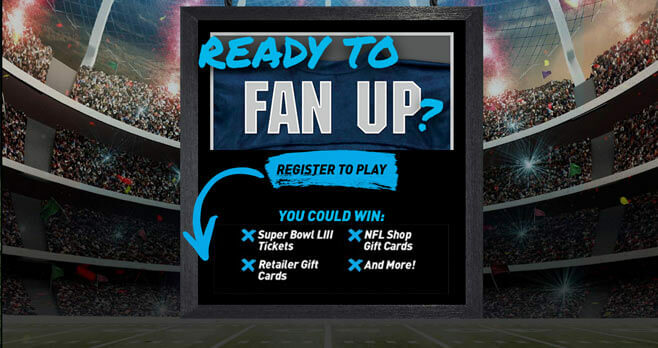 Play the Fan Up NFL Trivia and enter the Oikos NFL Season Sweepstakes for your chance to score Super Bowl LIII tickets, retailer gift cards, NFL Shop gift cards, and more. Register at oikosfanup.com now. The Oikos NFL Season Sweepstakes is open only to legal residents of the 50 United States and the District of Columbia, who are 18 (except Alabama and Nebraska 19 and Mississippi 21) years of age or older as of date of entry. The Sweepstakes begins begins at 12:00:01 AM ET on September 17, 2018 and ends at 11:59:59 PM ET on November 13, 2018. The grand prize consists of a trip for two (2) to the 2019 NFL Super Bowl in Atlanta, Georgia.